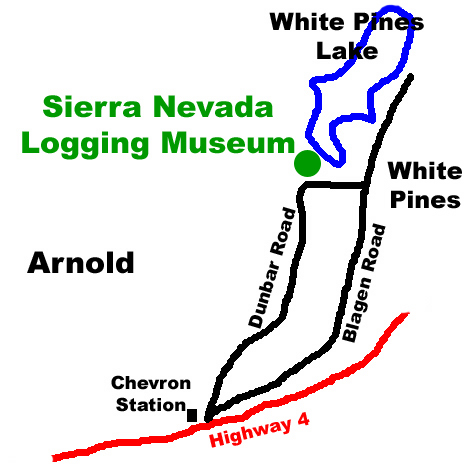 The Museum is centrally located in the heart of the Sierras, in the community of White Pines, near the town of Arnold on California State Highway 4. The seven-acre site sits on property originally occupied by the historic logging and mill workers’ camp of the Blagen Lumber Company (1938-1962). The Museum sits on a heavily forested hillside above White Pines Lake (elevation 4,000 feet). Ample parking is available at the museum, and the site is accessible year-round, although a heavy snowfall may leave us isolated for a couple days. From December 3rd through the end of March the museum is still open but we don’t turn on the heat unless we know you’re coming to visit (209-795-5672) (209-597-7376) . Give us a call — we’ll turn up the thermostat and round up the docents! 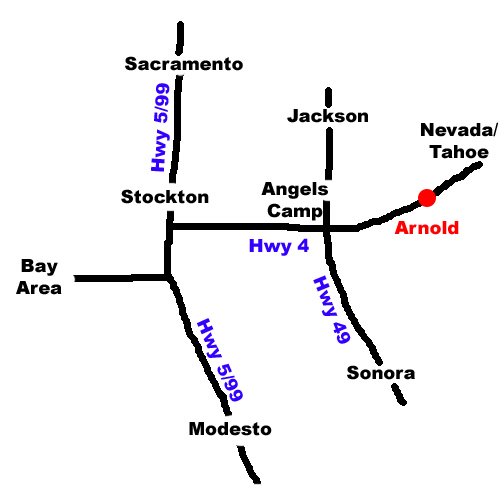 In Arnold, turn north at the Chevron Station onto Blagen Road and go one mile to Dunbar Road in White Pines. There will be signs for the Logging Museum and Hazel Fischer School. Turn left, and go another quarter mile. The Museum is on the right overlooking White Pines Lake. Follow the Museum sign into the parking lot. I was watching a Huel Houser piece on the train museum in Jamestown and they were all excited about restoring old #5 from the Pickering Lumber Co. I’m not a train person but the Pickering Lumber Co got my attention, naturally. My wife and I will be planning to sight see the hwy. 49 route in the near future, and would put your Museum as a site to visit. Is there anything left of the Pickering lumber co, and where would I be able to visit same. John, I put a new section about Pickering on our website just the other day. Take a look. In regard to what you might see of Pickering, as you know, one of their locomotives is at the Jamestown rail museum. One or two of their big buildings when they were still in the town of Sonora are still there being used by the JS West company. Their main mill was at Standard, just up the pass from Sonora and you can look at the mill, now in transition. SPI, the present owners are completely renovating the mill there, but it’s interesting to look around the area. Pickering did much of its logging in Calaveras County and by going north at Beardsley Dam you could see the old railroad grade that is now part of the road down into the river basin. Our museum has little or nothing about Pickering, but we think it is a great place to visit. We have a Shay locomotive that was used in the Yosemite area. There is quite a bit about this operation on our web site. The El Portal incline makes this a particularly interesting rail operation. The rail line at the top of the incline was the Yosemite Sugar Pine Lumber Company and at the bottom going into Merced Falls was the Yosemite Valley RR. I find Merced Falls an interesting place to visit because of their electrical generation capability. We have a great piece of film about this operation and be sure to ask to see it when you come to visit us. The Tuolumne County Historical Society and Museum has a huge collection of photographs, many of them of Pickering operations. Well since my earlier post, the Sierra Nevada Logging Museum has added a slide show about Pickering in 1958, the saw mill at Standard is now reopened and automated to the extent possible. We also have the old Corporate Headquarters sign mounted on the outside of our museum. Thanks for the reply. 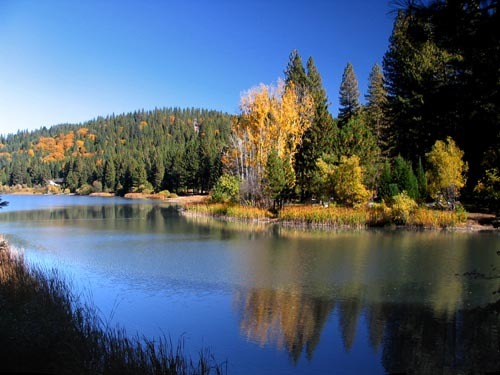 We now have some exciting places to explore, especially snlm, Jamestown, Standard and Merced Falls. Looking forward to our visit, probably in the spring.